Jack Kennedy: You took on the role of CEO at the end of last year, please outline your key vision for SAWEA and the role you see the association playing in industry? 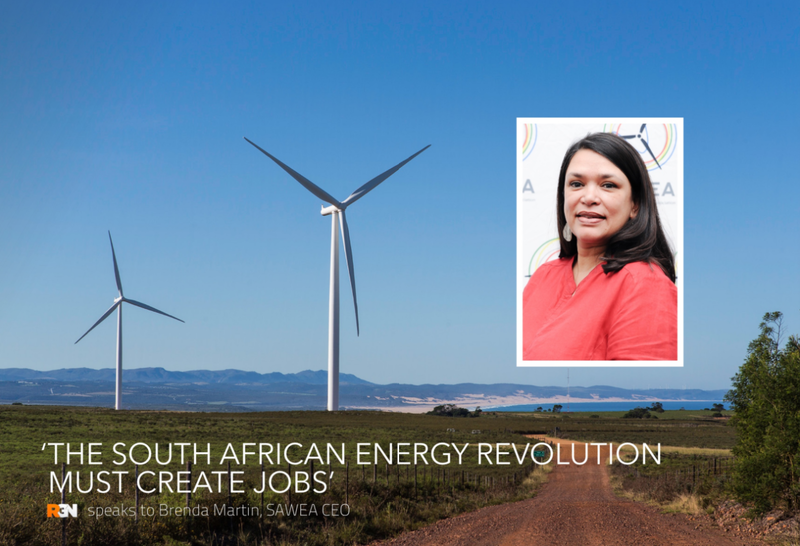 Brenda Martin: My vision for SAWEA is based on a long-held interest in building futures. In South Africa, this work starts with an appreciation for the process of transition, and a commitment to achieving transformation. Since the early 2000s, South Africa has established comprehensive policy commitments to an energy transition away from coal. As a nation, we have been engaged in a project of social and economic transformation over the past 24 years or so. In this context, as an industry association representing a sector which contributes just over half of SA’s renewable power, SAWEA has an important role to play in achieving both transition and transformation. The national utility scale renewable energy programme is just five years old. Relative to the more established other energy sectors, this Industry is young. It is my intention to ensure that we apply this trait to contribute youthful vigour, fresh thinking and creativity to SA’s incumbent power sector. JK: Statistics released by REN21 today showed a record for global investment in renewable energy, is this reflected in the South African wind industry? – How can you help to build on that? BM: South Africa’s wind industry has grown from a standing start to a contribution of 53% of the country’s renewable energy mix in just four years (first power commissioned in January 2013). A total of R73 billion has been invested in 36 wind projects in SA to-date. The average project size is 93.5MW. Wind power now contributes over 2,000MW of power, with some projects still being built and some delayed due to an ongoing impasse with the national utility. In SA renewable power is procured on the basis of ministerial determinations, and procurement is yet to be announced for more than half of already-issued determinations. The value proposition for wind power investment is clear: while supplying more than half of SA’s renewable energy power, this power has only cost 32% of the total spent on renewable power purchase. The value chain of wind power also offers important prospects for a key national developmental objective: job creation. Taken together, the investment potential for wind power in SA is significant. SAWEA works both to draw attention to this track record, and to ensure that Industry does not rest on its laurels but continues to improve its practice. JK: How strong is the governmental backing for clean energy, particularly wind, projects? Programmes such as REIPP have helped? BM: Government’s stated policy backing for clean energy is sound. The policy and legislative basis for the REI4P has been hailed as visionary, with many global accolades. By the end of 2015, over 60 power purchase agreements had been signed, and over 6,000MW of renewable energy power procured. Since then however, no further renewable energy power purchase agreements have been signed. For the past year in particular, SAWEA has worked to draw attention to the risks of ongoing delay, particularly as these relate to South African employees and companies, investor confidence and the realisation of future prospects which were on-track toward achievement by the end of 2015. JK: The ratification of the Paris Agreement shows commitment from government – how do you see that impacting the South African wind sector? BM: The wind industry is able to make a significant contribution to SA’s emissions reduction objectives. In 2016 alone, Wind power reduced SA’s power-related emissions by 3.7 million tonnes. JK: Please identify some of the major top tier wind projects in South Africa and the contribution they make to the South African energy landscape? Noupoort Wind Farm is an 80MW project comprising of 35 Siemens SWT-2.3-108 turbines. JK: Now that wind energy can produced at grid parity if not cheaper in a lot of cases than wind or nuclear, is it time that all new energy generation came from wind? BM: In SA today, wind power investment costs 40% less than new coal investments. SAWEA is supportive of a diverse energy mix. According to the Council for Scientific and Industrial Research (CSIR) the operational solar PV and wind projects (of BWs 1 and 2) triggered tariff payments of roughly R12 billion in 2016 and produced roughly 6 TWh in the same year, the entire BW4 solar PV and wind projects (BW4, BW4 Additional and BW4 Expedited) will trigger tariff payments of merely R6.6 billion per year while they will produce more than 9 TWh p/a. This means that in future bid rounds, renewable power will cost 45% less in annual payments while generating 50% more energy. While SAWEA remains is supportive of a diverse energy mix, we advocate for power supply investment decisions to be rational i.e. based on least cost, best value for money. JK: How would you rate the public opinion towards wind energy projects in South Africa – is there a feeling that clean wind energy needs to be championed over fossil fuels? BM: The SA renewable energy industry as a whole is relatively new. Nevertheless, we have a growing and strong support base, particularly as public understanding of the need to divest from fossil fuels also grows. JK: Previously SAWEA has said that 100% renewable energy in South Africa could be achievable in two decades – what major steps would have to take place for this to become a reality? BM: Making a transition away from a coal-intensive economy, particularly one which has only recently begun to include the majority of South African citizens must take into account due consideration of issues of social justice and development. While the transition must be decisive, it must include concrete measures to create jobs and achieve measurable and visible transformation on a number of levels. The SA Government has adopted the Integrated Resource Plan (IRP) as a policy instrument that helps plan South Africa’s electricity capacity until 2030. The first IRP (2010-2030) promulgated in 2011 envisaged establishing 17.8GW of renewable energy capacity by 2030 (Department of Energy, 2011). Of this, the IRP provides for 9,200MW of wind energy by 2030. To reach that target, 400MW of wind power would be connected to the grid every year until 2024 where the annual capacity targets change upwards. The IRP2010 anticipated that 10% of South Africa’s power mix by 2030, would be provided by Wind power. South Africa offers exceptional wind resource potential throughout most of the country, but particularly along our 3 000km coastline.